Died: 21st November 1918; age 30; died of Sickness – Prisoner of War – Chemnitz, Germany. Employed: at the Civil Engineering Department – Great Eastern Railway, Ipswich. Entered service for G.E.R. as a permanet way labourer – 20th July 1914. 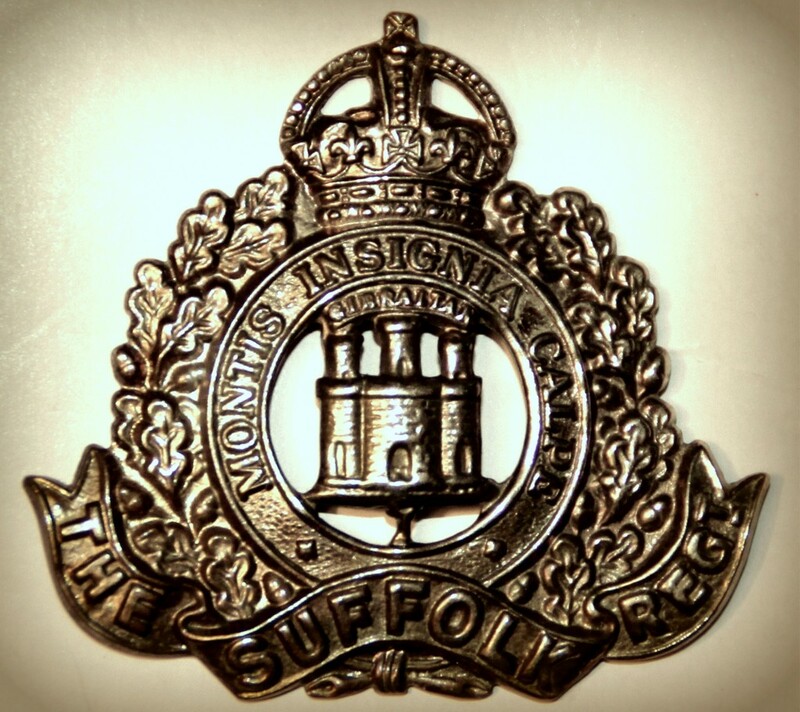 Enlistment Location: Ipswich – called to the Colours on the outbreak of the war. Rank: Lance Corporal; Service Number: 7299. 1891 Ipswich Road, Sproughton, Suffolk. Alfred was 3 years old and living with his twin sister, their widowed mother & step siblings. Ann Crooks (nee Stannard), 36, a Laundress, born Ipswich. Alice Emma Crooks, 10, born Ipswich. John Crooks, 8, born Ipswich. Frederick Thomas Crooks, 6, born Ipswich. Ethel Crooks, 3, born Sproughton. 1901 4, Sproughton Road, Ipswich. Alfred was 14 years old he was living with his mother, step father & step siblings. William Fenn Whiting, 38, a Carrier for Builder, born Hemingstone, Suffolk. John Crooks, 18, a Carrier for Builder. Frederick Crooks, 16, a Carrier for Builder. William Fenn Whiting, 9, born Ipswich. (Lizzie) Elizabeth Whiting, 6, born Ipswich. 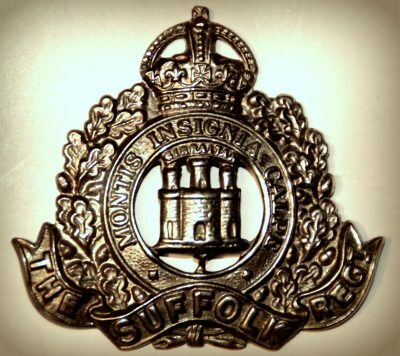 Alfred was 23 years old, a Soldier ranked Private for the 1st Battalion of the Suffolk Regiment. Probate to Frederick Thomas Crooks – brother, a Builder’s Labourer. 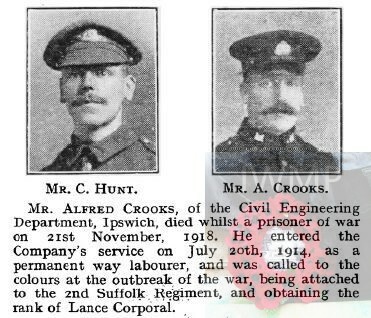 Soldiers’ Effects to Frederick Thomas Crooks – step brother. Alfred is also remembered on the Great Eastern Railway war memorial, Liverpool Street Station, London.